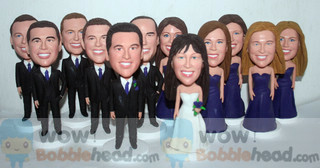 1, We 100% handmade custom cake toppers with Top polymer clay. Most custom cake toppers providers use poly resin clay and then they bake and mold the dolls - apply paint and the doll is yours... We uses Polymer Clay - the color is the clay so the final product is actually brighter, true 3D likeness and higher quality. We are equally proud of our customer service team. They go the extra mile to meet all your needs, making sure you are kept current on the progress of your doll and that every detail is captured. They are ready to brainstorm with you to design your custom cake toppers, too. Free proofs are given at different stages, on every custom cake toppers we create (*unless rush order for certain time lines). Changes will made to gain your max satisfaction. All our custom cake toppers are sculpted by Skilled sculpturer, which ensure your custom cake toppers come out with high likeness and best details. usually get within 2-3 weeks, want faster? we can made and send it out within 5 days! 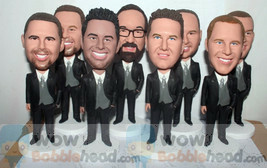 You will be amazed at how much detail we can offer on your custom cake toppers doll.